SE 199x ? kr ? The Sega Game Gear is a "portable" device which was designed to address problems with Nintendo's Game Boy. It is held lengthwise at the sides (preventing the cramping of hands which plagued Nintendo's system) and has a backlit, colour LCD screen, allowing for clearer and more vibrant visuals than its main rival. Similarly to the Sega Mega Drive, which at the time was Sega's main focus in the home console market, the Sega Game Gear is derived from the earlier Sega Master System. Unlike the Mega Drive, however, the Game Gear is largely identical to the Master System, the major difference being a VDP capable of displaying palettes consisting of a wider variety of colors, and the playback of stereo sound. Game Gear games traditionally run at a smaller resolution too, although with a screen built similarly to televisions of the era, the Game Gear is fully capable of playing games in higher resolutions. Like the Master System, the Game Gear features a D-Pad and two buttons, and , but also adds a third, . This is one button short of a Game Boy. 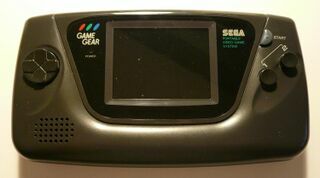 Unfortunately, due to technical limitations of the era, the Game Gear demands six AA batteries to be played on the go, of which the fluorescent backlight on the LCD screen will eat through in three to five hours (though a battery pack provides longer playtime). Furthermore, the system gives off more heat than the Game Boy, often leading to "sweaty palms" after prolonged use. The system was also considered not to be very "portable" - it's bulky size means it does not fit in many pockets, and the power-draining backlight of the LCD screen (which cannot be turned off) meant Game Gears were unusable after a short period of time. An AC adaptor can be plugged into the system so that it runs off the mains, but this was not considered practical for consumers of the day. Main article: Game Gear consoles. The hardware is largely identical to the Sega Master System, with some of the differences mentioned below. Main article: History of the Sega Game Gear. Main article: Sega Game Gear games. Main article: Sega Game Gear/Magazine articles. Main article: Sega Game Gear/Promotional material.